A new, high rise condominium development located in the Cosy Beach area of Pratumnak Hill. This high rise building is within easy access to international restaurants, convenient stores, local taxi's and beaches. 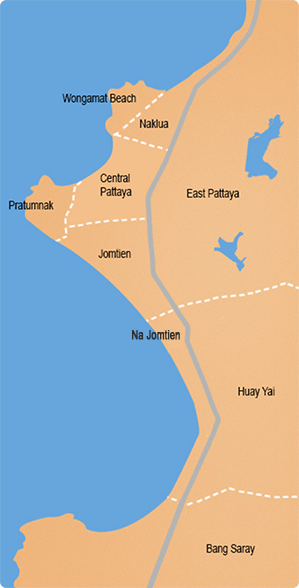 Pattaya City and Jomtien are only a short drive away. This modern style 1 bedroom condo apartment on the 10th floor has a living area including the balcony of 48m². The condo is fully furnished and decorated to good western standards including a built in European kitchen with baking oven, a comfortable living area, a good size bedroom with a queen size bed and a built in wardrobe. Facilities of the complex: 24/7 security and CCTV, key card access, lobby area, fitness room, communal swimming pool, children’s playground, underground parking, cleaning service, etc. FREE Cable TV and Wifi connection. The title deed is in foreign name, with tax and transfer to be split 50/50. The condo is offered for a minimum of a 3 month contract at 28,000 Baht, with 6 month contract at 25,000 Baht per month and as advertised with a 12 month contract at only 22,000 Baht per month.